When we received a package of 3 lifelike bear replicas from Safari Ltd., I knew that they would be excellent for a guided story-telling. 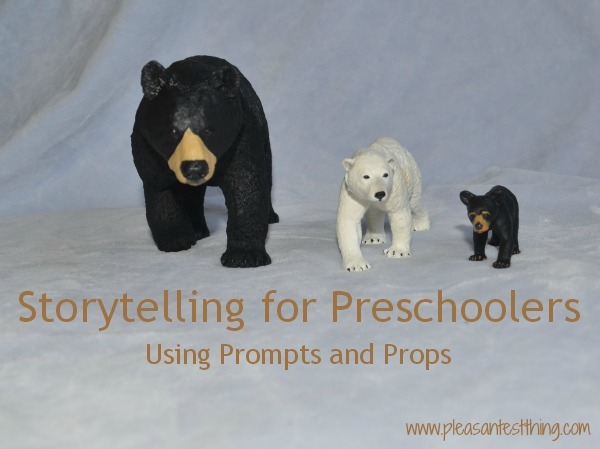 My preschooler enjoys storytelling, and often his play involves complicated scenarios. He enjoys creating stories, but I wanted to introduce a literary framework to him. By acting out the story as we went along, and by giving him prompts and a bit of guidance, he created his own, structured story. Step 1: WHAT IS THE SETTING? 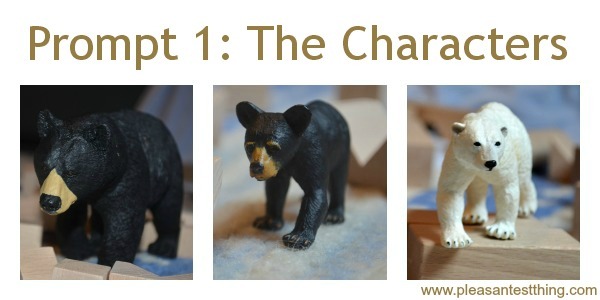 We used 3 lifelike replica bears: A black bear (Bayah), a polar bear (Kay-yah) and a black bear cub (YaYa). For our story, YaYa is a cute cub who loves to climb and is always curious. Baya is a black bear who loves to explore and is always friendly. Kay-ya is a “fluffy white” polar bear who loves to run and is always happy. I gave him prompts for the setting of his story by explaining that he had to figure out where the bears would live, and where most of the story would take place. He decided that the cub lived in America, the black bear lived in China, and the polar bear lived in Antarctica. Most of his story would take place in America, where the black bear lived. I explained a story describes a problem and how it’s solved. He wanted this story to be about “Beary-Thanks,” a large meal that bears enjoy together once a year. He decided that this feast should take place in America, where he thinks that there is food that bears prefer (honey, fish, and berries). His problem to solve was that the animals didn’t live in the same location. Prompt: How Do The Characters Try To Solve The Problem? I prompted him with “How did the bears all get together,” explaining that after introducing the setting, stories describe how the main characters work to solve the problem (the “rising action”). 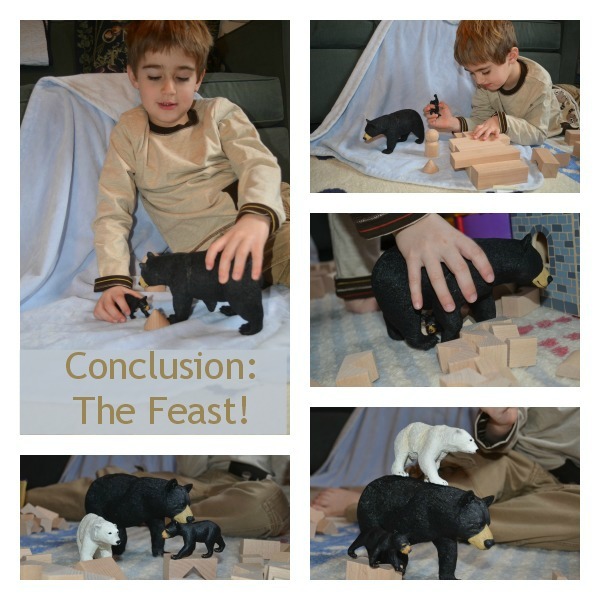 He had to figure out how to get the bears, from all different parts of the world, together for their feast. He decided that the polar bear was going to ride on a ice floe to meet the black bear in China. The two bears would then travel together by boat to America. He set his bears in 3 different locations (a blue blanket was used as the ocean), and built wooden block ice floes and boats for the bears. I debated whether to leave his story as it was, or to explain that the polar bear’s ice would melt before he reached China. I decided that I would tell him that to get from Antarctica to China the bear would have to pass through warm areas, where the ice would melt. I then let him think through the problem. 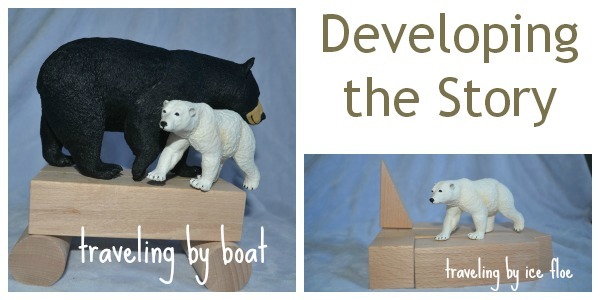 He decided that where the ice would melt the polar bear would have a boat waiting. The polar bear would then go pick up the black bear, and the two would travel together. I didn’t prompt him with the climax. The bears had a tough journey by boat, but at the end, it was clear they would reach their goal to meet up with the black bear cub. My preschooler brought all 3 bears together. Prompt: How Does the Story End? My son decided to have the story end at the “Beary Thanks” feast, with the bears all climbing trees for honey, and diving into streams for fish. The falling action for our story was the bears sticking their paws into honey. 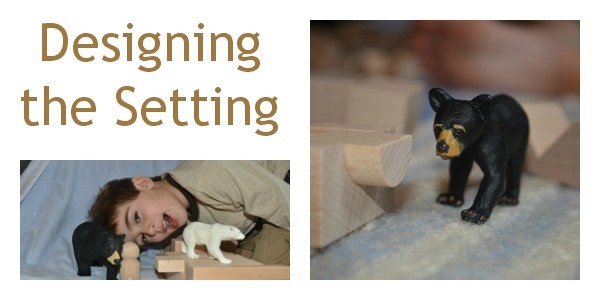 For more imaginative ways to use replicas, you can follow Safari on Pinterest, Facebook, Twitter, or Google+. Disclosure: Safari Ltd. provided us with the animal replicas and is providing a replica to the giveaway winner. I was not compensated in any other way. I only recommend products we use and love.